Shahnameh: The Epic of the Persian Kings, illustrated by Mr. Hamid Rahmanian, a noted filmmaker and graphic designer, and translated by Dr. Ahmad Sadri, Gorter Professor of Islamic World Studies and Professor of Sociology at Lake Forest College, affords the reader an exciting introduction to Ferdowsi's epic saga of ancient Persian triumphs, tragedies, romances, and heroic exploits. Shahnameh: The Epic of the Persian Kings is a lavish publication with almost 600 pages of striking illustrations -- collected and reassembled by Rahmanian from thousands of miniatures and illustrated manuscripts, ranging in geographical locale from India to Turkey – is quite possibly the most beautiful book that we have ever seen. Written over a thousand years ago in medieval Iran, Ferdowsi's epic is as important to Persians as the Illiad is to Greeks and the Ramayana to Indians. Ferdowsi is responsible for safeguarding a collective Persian past -- one before the Arab conquests of the seventh century CE -- through his collection of Persian myths and legends. Despite the enduring and enormous popularity of the Shahnameh across the Persian-speaking Near East for over a millennium, it remains relatively unknown and vastly underappreciated in the West. Through this publication, Rahmanian and Sadri have given one of the greatest treasures in the canon of world literature new vigor and enhanced appeal. Although in its original form the Shahnameh was composed of a series of couplets, Sadri’s translation and adaptation is presented in melodious prose. Those familiar with the sounds and cadence of Farsi will delight in Sadri’s translation, which retains the whimsical feel of the original, while the prose narrative compliments the ethereal, breathtaking illustrations found throughout the publication. When reading the text, we found ourselves marveling at how skillfully Sadri was able to abridge the text into accessible chapters for a modern audience. Aside from the gorgeous illustrations and the charming prose, we found Ms. Sheila Canby’s foreword to be informative. Rahmanian’s Preface and Sadri’s Translator’s Note, Editorial Philosophy, and The Vision delineate how this version of the Shahnameh differs from others. To help guide readers through the complicated world of ancient Persian lore, there is a useful family tree for the main characters. The book concludes with a chapter on how Rahmanian was painstakingly able to illustrate this title. The Ancient History Encyclopedia strongly recommends this book to those stirred by great art and literature. It makes wonderful and imaginative reading, whether you are already familiar with the plot of the Shahnameh or not. This volume has been published in English through Quantuck Lane Press in the United States and is currently available for $ 51.74 in hardcover. Wiener, James B. 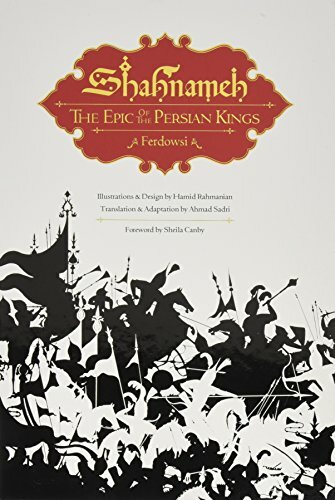 "Shahnameh: The Epic of the Persian Kings." Ancient History Encyclopedia. Last modified March 04, 2014. https://www.ancient.eu/review/51/. Wiener, James B. "Shahnameh: The Epic of the Persian Kings." Ancient History Encyclopedia. Ancient History Encyclopedia, 04 Mar 2014. Web. 19 Apr 2019.